If people outside Glasgow know anything about the Gorbals, they probably associate it with slums and street gangs, thanks to the book No mean city (1935) by H. Kingsley Long and Alexander McArthur. This Picture Post article from 1948 also paints a horrifying portrait of the extreme poverty suffered by Gorbals inhabitants. In an attempt to ameliorate this, the old slums were cleared in the 50s and 60s, but replaced with poor quality high-rises which did little to improve the area. Third time lucky? Since the 90s, the area has been redeveloped again with modern interpretations of traditional tenements in a mix of private and social housing. I always enjoy visiting parts of my own city that I don’t know very well, and recently followed a walk in the Gorbals from Roger Smith’s Urban walks: Glasgow and the west (Birlinn, 2009) which I borrowed from the local library. 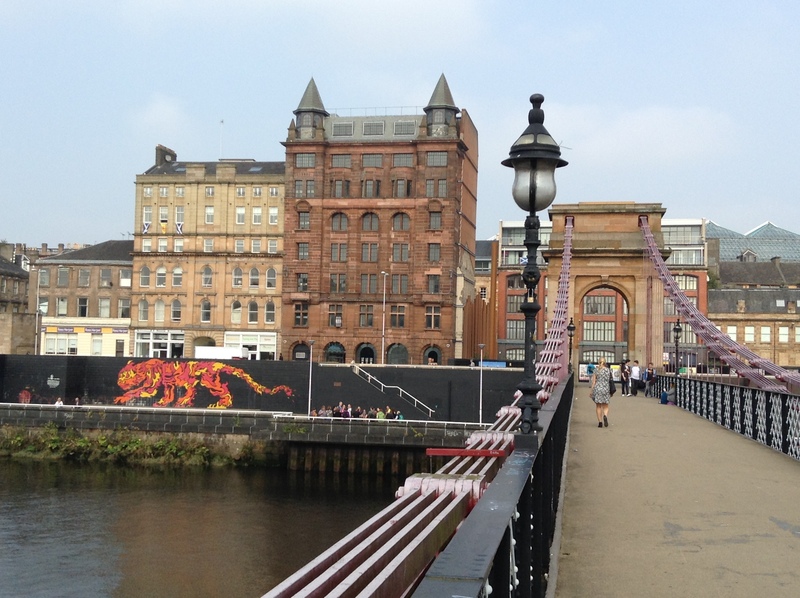 I really liked the Gorbals – a good selection of housing styles…..
…..and lots of public art. The reason for the Saltires (Scottish flag) in some of these pictures is the Independence Referendum which takes place tomorrow. I saw many flags and Yes posters, but very few No ones. By breakfast time on Friday, we should know the result. There were still a few old buidings around, some renovated, some in the process of renovation and one, sadly, in a state of decay. Caledonia Road Church was designed by Alexander “Greek” Thomson, arguably Glasgow’s second most famous architect, and built in 1857. In 1965 it was damaged by fire and has been a ruin ever since. The portico should give you a clue to the reason for Thomson’s nickname. I do love a walk round an old graveyard, and the Gorbals has the Southern Necropolis. As you can see, not all the high-rises have been demolished – these two towers are still occupied. I was mightily impressed with the fungi too, which rivalled anything we saw in Virginia on holiday. However, the real point is the graves – some of those below, I just chose because I liked them, others are significant because of their occupants. The austere black marble tomb was erected in 2006 and the inscription simply reads “Thomson” – the architect referred to above. The grave marked 7 is a memorial to Agnes Harkness, known as the Heroine of Matagorda for her bravery in a battle in Spain in 1810. The picture to the right of Agnes shows the tomb of Sir Thomas Lipton, a Gorbals boy made good who founded a chain of grocery stores and a brand of tea. In the centre of the row beneath them is the White Lady sheltering Magdalene Smith and her housekeeper Mary McNaughton who were killed by a tramcar in 1933. The broken stone marked 30, bottom right, commemorates Janet Jack, Bridget Ward and Margaret Jack Adams who all died in a factory fire in 1895. Margaret was only 15. The Gorbals is on the south side of the River Clyde which bisects Glasgow. After my walk, I crossed back onto my own side of the city having learnt a lot on my urban walk. Fascinating history and such wonderful pictures. I love exploring old cemeteries and I don’t think I have ever seen a fungus like the one pictured. It’s weird the way just one tree has it – why that one? It must have something special. So very beautiful. It will be interesting, indeed, to see how the vote on Scotland’s independence goes. Being from East Europe, I know that given the change people prefer independence. I hope everything will remain peaceful, as you commented, however it goes. I hope so too. There are a lot of people who are very afraid of independence as well as those who are hopeful. I’ve always regretted not visiting my former roommate back in 2009 when she studied abroad in Glasgow. It looks like a fascinating city! This referendum business is causing quite a buzz all around the world. No matter the outcome, I hope the Yes and No camps can reconcile with each other! It’s a very emotional time – I voted earlier and am now VERY nervous. The campaign has been good natured for the most part so I hope we can continue to live in friendship however it goes. We need to keep the heid as they say here! Thanks, Steve. I had a look this morning but it’s a closed group so I can’t see. I checked quite a few other webpages though, because I thought I might include a picture of Old Gorbals and one of the 1960s version, but very few were free-to-share so I didn’t. The changes have been fascinating though! Thanks Birgit. Yes, we have always been a country, not a region, and already have a separate legal system, education system etc. Will we be on our way to being an independent nation tomorrow? I don’t know, but I know I’m voting yes. Nice photos! That’s quite the fungus growing there. We didn’t get to Glasgow when we were over there. I’ve been watching the news about the Referendum, wondering which way it will go and which way Scotland would be better off. It’ll be interesting to see what happens. Off to vote soon! It seems to be on a knife edge with no slightly ahead, but within the margin of error. By this time tomorrow, we should know, gulp. Anabel, I think it’s important to keep exploring your own city. Isn’t it interesting when you go with someone, like a guide, who points out things or stories that you never knew about. I find this fascinating! It is! I do a bit of tour-guiding myself for Glasgow Women’s Library which has inspired me to look further afield, so I now know so much more than I did two years ago. Thanks for tweeting too.